NEW LIFE: Pictured (L to R) outside Clementhorpe Maltings, York, are Croft Farm Construction site manager, Alex Birch; LHL Group director, Richard Hampshire; Northminster Ltd managing director, George Burgess; Northminster Ltd development surveyor, Alastair Gill and Croft Farm Construction director, Andy Summers. A £2.1m scheme to bring part of York’s brewing history into the 21st century has completed with the creation of six new townhouses. After nine months construction and refurbishment work by York developer, Northminster Ltd, new homes at former 19th century Grade II listed Clementhorpe Maltings are going on sale. As well as being among only a handful of former UK malting houses to have survived, the 10,000 sq ft property, which has not been used for half a century, had many of the original maltings artefacts, which have been conserved and are a feature of the new homes. Entrance to the townhouses, which are between 1,100 sq ft and 1,500 sq ft, is through an attractive three-storey open atrium housing the industrial artefacts. The homes have three storeys with a lower-ground floor utility and store area on the former barley-growing floor. Two of the homes are two-bedroom and four have three bedrooms. Part of Northminster Ltd’s commitment in obtaining planning permission from York City Council, which owned the property, was to preserve the historic malting artefacts which include a double-bucket elevator, large hopper for grain storage, seed-dressing machine, a cast iron steep and furnace, and this led to the creation of the show area within the communal entrance. Among other parts of the original building to have been incorporated as character features into the new homes are roof and floor timber beams, upright steel posts, Victorian cast iron columns, the original quarry tile floor in the atrium and malt bin doors. The scheme was designed by COG Architecture, Leeds along with civil and construction engineers, Topping Engineers, Harrogate; built by York building company, Croft Farm Construction, while York property and construction consultants, LHL Group Ltd, managed construction for Northminster Ltd. The Association for Industrial Archaeology advised on restoring the artefacts. The houses are to go on sale through York estate agents, Hudson Moody, Micklegate. 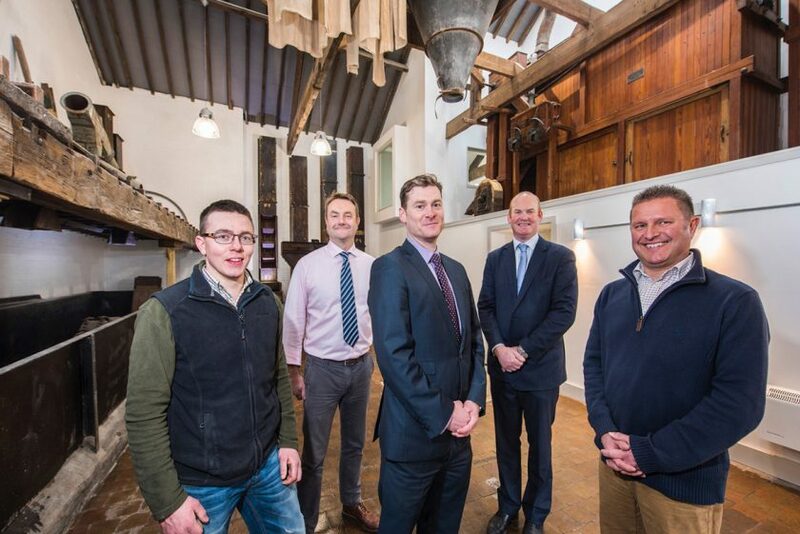 Northminster Ltd managing director, George Burgess, says: “The scheme appealed us because of the challenge of dealing with such an unusual, historic building. As the property is Grade II listed, we had to adapt our design to work within the constraints of the original structure but this has created wonderful, characterful homes. “Our enthusiasm for the restoration was shared by our architects and engineers, whose vision and hard work made it deliverable and has enabled us to complete the homes to such a high standard internally and externally. Researchers say that the property was built in the late 19th century and bought by Tadcaster Tower Brewery Company in 1903 which used the maltings until the late 1950s. Northminster Ltd, which has also been responsible for the development of Northminster Business Park, also developed the award-winning Piccadilly Lofts, Piccadilly, York, in 2015 and is currently re-developing the former Lord Nelson public house and car park, Walmgate, as modern sustainable housing. Clementhorpe Maltings has an open viewing and reservation day on January 14.